Had he still been with us Frank Sinatra would have been 102 today and, although he's now long gone, his memory lingers on. His Rat Pack buddy, Dean Martin, would have been 100 this year. My dear friend, Lydia Diel now lives in New Jersey but, way back when, we both attended Jarrow Central School albeit at different times. 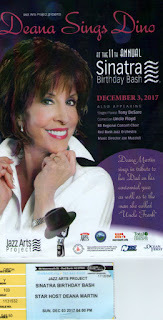 Today, I received, not only a Christmas card from Lydia but also a report, program and ticket stub from the Count Basie Theatre in Red Bank of a concert by Dean's daughter Deana whereby she pays tribute in song to her father and her 'Uncle Frank'. I really don't want to make you envious but I went to the Count Basie [Theatre] for the Jazz Birthday Bash. Frank would have been 102 this year; Dean Martin 100. His daughter Deana is 69 but doesn't look it. She has a fantastic voice, is a superb entertainer and skips about the stage like a 2-year-old!. Between songs, she told great tales about her father and 'Uncle Frankie'. It was over 2 hours and the audience laughed between songs at the jokes. Sorry you missed it. Yes, I'm sorry I missed it too but how fantastic that Lydia's card and bits and bobs landed today of all days! Merry Xmas Lydia and Happy Anniversary Frank - wherever you are!